There are sufficient places to go boating in northwest VT. Major lakes and rivers are the primary choices. Boat launch facilities and the size of your boat may limit your choices. Often, out-of-the-way, smaller waters are less crowded and can provide a slightly different boating experience. Use these boating resources to locate nearby boating equipment and accessories to enhance your time on the water and keep the boat well maintained. Whether it's a family adventure or a fishing trip, boating in Vermont can be fun for all. Listed below find resources for boating accessories, equipment and supplies. Resources are listed relatively to cities and attractions. Cities listed include Burlington, Shelburne, St Albans, Vergennes and Waterbury. Contact them with your questions about safety equipment, marine electronics, water toys and accessories to enhance your boating experience. Locate boating gear, equipment and accessories at boat dealers, sporting good stores and RV centers throughout Vermont by location within or nearby cities in northern and western Vermont. 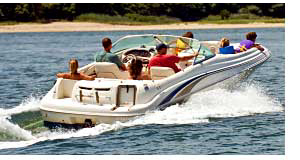 Northwest VT boating supplies, marine equipment and water sport gear. Keep your boat well maintained and grab some water-sport, activity items for family fun at the lake. Boating accessories are available from Vermont boat dealers, sporting good stores and discount outdoor centers for all type boats including car toppers, ski & wake board boats, fishing and bass boats, speed boats, inflatables, jon boats, sailboats, pleasure boats, family boats, luxury yachts, pontoon boats, cruisers, cuddy cabin boats, canoes, deck boats, aluminum boats, electric boats, jet skis, personal watercraft and fish-and-ski combos. Click here to locate boats for sale in northwest Vermont. If your interest is fishing, click here for fishing boats for sale in Vermont. Lake, weather and boating conditions matter. Marinas like Malletts Bay Marina, North Hero Marina and Shelburne Shipyard, which reside on local waters, can often provide lake levels, launch ramp access information and current weather conditions for boating. Vermont is a boating paradise, get out and enjoy it every opportunity you get. Any time you are on the water in Vermont, make safety a first priority. Additionally, every boater should carry boating insurance for the protection of individuals in your boat as well as others on the water. You can acquire a licence for your boat by contacting the Vermont Boat Licensing office. Enjoy the northwest Vermont waterways in a boat fully equipped for convenience, safety, comfort and pleasure with boating supplies, accessories and equipment from these local boating outlets. Find boating in other states.